HOT, SHOT, AND BOTHERED by Nora McFarlandTouchstone (08/11)Review by Linda S. Brown(6/30/11)McFarland’s debut novel, A BAD DAY’S WORK (Touchstone, 2010), introduced an intriguing rookie character to the soft-boiled mystery world: a news videographer named Lilly Hawkins, based out of the small town of Bakersfield in California’s agricultural Central Valley. Lilly is smart and smart-mouthed, a talented and ambitious newshound in a small, compact body – but sporting size 10 work boots. As one of the few women camera operators, Lilly has a bit of a chip on her shoulder; and it just may be that a few misspent moments in her youth contribute to that attitude. The first novel was an enjoyable and respectable debut. 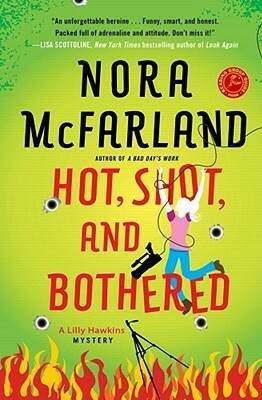 The new book in the series, HOT, SHOT, AND BOTHERED, shows McFarland’s growth as a writer who has added depth to Lilly’s character, and who demonstrates tighter writing and more complex plotting.In HOT, SHOT, AND BOTHERED, Lilly gets caught up in a firestorm in the foothills of the Sierra Nevada Mountains. Instead of rushing to evacuate the little resort/farming community of Lake Elizabeth, Lilly drives headlong into the path of the news story – and the fire. As in any small community, there are secrets that lie hidden, some beneath the surface of the lake, some in the city politics. Lilly believes the fire may have been started as a distraction to cover up a local scandal involving a young woman Lilly knew years before. But can she prove the cover-up before getting trapped by the raging wildfire?Back at the newsroom, McFarland has created a rich environment with politics fuelled by diverse characters such as the acerbic assignment manager, a couple of sidekick crew members that are slightly off-kilter (or maybe slightly high, but always amusing and oddly efficient), an on-again-off-again romance between Lilly and Rod (a local newscaster with Hollywood looks and Los Angeles sophistication), and an aging hippie/redeemed black sheep uncle who has recently reentered Lilly’s life. All of these characters are devoted, in their own unique ways, to protecting the prickly Lilly – from herself as well as outside dangers.This is a fun series, with a sharply drawn and evolving cast of characters in the fast-moving world of television news. In HOT, SHOT, AND BOTHERED, McFarland has demonstrated her chops as a researcher as well as a writer: the firefighters and emergency workers, the scenes and equipment, and the dirt and exhaustion and adrenaline -- all rings true. Lilly Hawkins has her work cut out for her, and Nora McFarland makes sure she’s up to the task. Nora McFarland's Lilly gets the picture and solves murderI missed the first installment in this trilogy about Lilly Hawkins, the TV photographer who also happens to solve murder mysteries. The writing is EXCELLENT, and I do not toss that compliment around lightly. The plot of “Hot, Shot, and Bothered” centers around two events: one is the wildfire that threatens an upscale subdivision of Elizabeth Lake (in the Bakersfield, California area), and the other is the discovery of the body of Jessica Egan, a young woman who has devoted years to the cause of conservation of the environment. Lilly is seemingly outraged less by the fact of Jessica's death than by the slander that accompanies it. Jessica is described as a party girl who ran with the wrong drugging-and-drinking crowd since she was a teenager, and unfortunately drank too much before getting into a small boat the night she died. But Lilly knows a lot more about Jessica's past and about her true character – Lilly recognizes the description of Jessica as completely contradictory to the girl she knew in high school. How does a bit of a goody-goody slide all the way over to hopeless lush? Not bloody likely, is the answer to that.Lilly also has the good fortune to be one of only two photographers on the right side of a breaking story about the fire and a visit from the governor. She interviews the brother of the victim, who happens to be one of the firefighters on the line. She manages to alert her news partner Rod to get over there before the roads are closed. And she even latches onto the key bit of evidence in the back yard (literally! in the back yard!) of the victim that unravels the whole sad story. EXCELLENT lifelike characters, EXCELLENT seamless writing, good use of humor, and realistic and convincing detail about the news biz. Four stars. I really like this series and this author and will try to alert others to read her. Lilly Hawkins works for KJAY news as a shooter. Lilly was finishing up packing the news truck when she sees the coroner’s van go racing by. Lilly’s nose for news goes racing. Lilly jumps into the truck and takes off after the coroner. When Lilly arrives at the scene, there are some divers pulling a body out of the lake. At first glance, it seems that the death was the unfortunate result of a drowning accident but Lilly suspects there is more to the story, when Lilly realizes that she knows the victim. Hot, Shot and Bothered is book two of the Lilly Hawkins novels. The first book is A Bad Day’s Work. This book can be read as a stand alone novel, which is a good thing as I started with Hot, Shot and Bothered. Hot, Shot and Bothered is the perfect cozy mystery novel to add to your collection. Lilly was the star of this book. She is a wise cracker, who had determination, can hold her own with the guys and is the right woman for the job. Just don’t call her a reporter. She is a “shooter”. There is a big difference. A reporter is someone who is in front of the camera and reports the news, whereas, a shooter is the video camera person, who video takes everything. This book is a quick read. I was already half way done before I stopped to take a break. The characters in this book were entertaining. They are people that I would expect to see in a who dun it book. I plan to go back and check out the first book as well as keeping my eyes on the release of book three. 3.5 stars. So this was #2 in the series and I went into it without first reading #1. Not a huge mistake, but I wish I knew the story of Lilly & Rod and whatever trouble Lilly got herself into in the first book. It took me a while to get through this book because....well, I'm not sure. Lilly wasn't my favorite heroine ever...I didn't need all of the "shooter" details...it was obnoxious that she was so focused on the case despite the HUGE, IMMEDIATE DANGER of the wildfire. I mean, I see the issue of the murder....but I didn't need to hear "I owe her for a favor she did me thirteen years ago" story on every other page. Oh well. In spite of this, the story did keep me turning pages, especially once Rod came and the intensity picked up. I think I'll go ahead and pick up the first book and see how that is. Lilly Hawkins is back! This time covering a career-making story: a wildfire in the Sierras. She’s a little more grown-up than she was in A Bad Day’s Work and manages her relationships and her work responsibilities a bit better. But that doesn’t stop her from becoming distracted by the mysterious drowning of an old acquaintance. What she remembers of the victim and what she hears from the locals just don’t add up. She wants to get the coverage of the wildfire right, as much for her benefit as for the benefit of the station. But she can’t help herself from getting involved investigating when the local authorities have left the case alone. The high-energy adventure that follows is pure fun for a reader. Complete with environmental activism, small-town politics, and even more of an inside view of a small town newsroom Hot, Shot and Bothered is highly recommended. Nora gave out arcs of her upcoming book at Malice Domestic on May 1/11.Thanks to Nora and her publisher for giving out the books. I enjoyed it and will definitely read the first one in the series.No problem following the characters but I'm guessing the first book provides more background on the characters. This is my new favorite series. I just love Lilly and Rod together and can't wait to see where the next one goes. Fun read. Liked the lead character. Want to read the first one now. This is the second book in the Lilly Hawkins Mystery series, part of a three book trilogy. This time Lilly is covering a deadly wildfire burning in the California mountains. Two firefighters have already died and tension is high. In the midst of this state wide emergency, a body of a young woman is recovered from the bottom of a lake. The drowning appears accidental. The young woman named Jessica, was reportedly a bit wild and into drugs and alcohol, so there is no investigation since all the local emergency and police resources have been diverted to handle the quickly spreading fire. Lilly is told to focus her energy on the fire and forget the drowning. However, when Lilly finds that the victim is a girl she knew in her past, she quickly becomes suspicious that a murder may have been committed. She tries to find out more about the drowning and every detail she discovers confirms her suspicions. However Callum at the newsroom does not want to hear about it and he insists Lilly get back to shooting video of the fire. This could be a big scoop for the station especially as a perfect storm situation is brewing, a mandatory evacuation has been ordered and many of the roads leading into the scene are closing down. The wind, humidity, temperature and terrain are all combining together to feed the fire and it could explode. But Lilly is determined and goes ahead despite Callum’s orders. This mystery comes to involve an environmental organization known as Green Leaf, a large land development that eventually became a nature preserve, a threatened salamander population, a troubled daughter/father relationship and some of Lilly’s murky past.In this second volume Lilly has graduated to the chief photographer’s position. She is still the only full time female shooter in town and one of a very few in the entire country. Rod has moved out of reporting and is now producing the 11 PM news. He really needs to move to a bigger town if he wants his career to take off, but he is staying because of Lilly. Rod and Lilly have been living together in Uncle Bud’s house for seven months now and their relationship seems to be doing well. They are very private though, and Lilly has a strict rule about displays of affection at work.Lilly continues some of her quirky ways that were revealed in the first book: she still nick names characters based on her initial impression of them, so “Slim” is the slug reporter from L.A. with the super equipment who eventually becomes known as “Slennis” and then finally as Dennis once she knows him better and decides the derogatory names don’t fit. “Pukey” is the young teenager who helps an experienced diver retrieve Jess’s body from the lake and subsequently loses his lunch when he looks at the body.Rod is developed further in this book and we discover more about what this seemingly smooth character with his well combed hair, polished Italian loafers and fine cut suits has hidden from most people. Despite his calm and confident appearance, he gets stage fright, and he is also a bit geeky – he is a Star Trek fan! Although they seem to have a sterile and rather uninteresting life together at the beginning of this book we get to know a little more of their relationship when they are thrown together for a couple of days to report and shoot the fire. We learn more of Lilly’s back story and her troubled days after her father’s death. She is not proud of her behavior during that time and it is perhaps a little of why she is so attracted to Uncle Bud, who also has a hazy past. It also seems to me that Uncle Bud would be a great companion for Grandma Mazur in the Stephanie Plum series. Wouldn’t they make a great couple? ?Lilly continues to be abrupt and rude and abrasive. But we can already see some changes from the way her character was presented in the first book. At that time, she had many misconceptions about her coworkers at the news station. Some of Lilly’s hard edges seem to be softening. Lilly is also a little (not much mind you, but a little) more controlled about hiding her thoughts and feelings. She learns some valuable lessons in this one about the mistakes we all make in our lives over time and the difficult compromises we face when we critically appraise what we want and weigh it against the reality life presents to us. Things were getting a little long and drawn out toward the end of the book when it seemed the fire -fighting would never end, but then things picked up quickly. There is a lot of good tension and suspense in this one and the suspects are all portrayed as credible killers so you are really guessing until the end.I look forward to book three because there is a promise that we may find out more about Uncle Bud’s history and there is a hint that the character of Bell a woman firefighter may become a continuing character.Fun read and even better than book one. In this second book of the Lilly Hawkins trilogy, Lilly, a California photojournalist (or shooter), deals with a wildfire in the nearby mountains, the murder of a fanatical environmentalist, and her own fear of judgment for past mistakes.For this reader, McFarland’s use and description of the forest fire is one of the best plot devices of the book. As the flames encroach on a small mountain town and the smoke thickens, the tension races off the page with the force of a fire whipping through dry pine. As for the murder victim, Jessica Egan, it turns out she and Lilly shared a past, one that Lilly isn’t proud of. Even though there is this connection between the two women, I wasn’t able to completely buy Lilly’s motivation to become involved in the murder investigation. I don’t know if other readers would have similar concerns or not. On the positive side, the author develops Jessica as a complex and complicated woman. Character development is another of McFarland’s strengths for me. Lilly matures over the course of the story, even though that sometimes saddens her as she mourns the loss of some of the impetuousness and integrity of youth.I received this book to review from Touchstone, the publisher, I not only recommend it, but I’ve now bought the first Lilly Hawkins mystery in e-book form (A Bad Day’s Work), and look forward to the third being published. I’m glad I’ll get to share more of Lilly’s life and work. Lilly Hawkins, a videographer for a local television studio to record a wildfire that is raging on the foothills of the Sierra Madre Mountains. While there, she learns that a body of a woman pulled from a lake is a former friend of hers. Intrigued by the death and doing her on investigating, she begins to believe that her friend Jessica’s death was no accident. Now she has to deal with being trapped by the fire or by the possible murderer.Hot, Shot and Bothered is witty, energetic and good fun. Lilly is a character that this reader enjoyed getting to know. She is a determined woman who is a little sarcastic. I found the action fast paced and the story flows right to the climax. McFarland has written an entertaining thriller; not to heavy but quite enjoyable. Add this one to your summer reading list. TV news shooter Lilly Hawkins is filming the wildfire burning out of control near Bakersfield when a body is found in a lake. When it turns out to be someone she knows and she doesn't buy the story of how she died, Lilly sets out to find the killer. I missed the supporting cast from the first book, although I still enjoyed my time with Lilly. Decent mystery, too. My biggest issue was actually the fire - hit a little too close to home for me.Read my full review at Carstairs Considers. Really enjoyed this second installment in the Lilly Hawkins series. Lilly is opening up as a person, letting people in and losing the hard chip on her shoulder. It's a wonderful process to watch, and Nora McFarland handles it like an expert. Meanwhile the mystery kept me flipping pages and the zinger lines kept a grin on my face.Solid second installment in the series. Looking forward to Going to the Bad -- #3 in the series. I enjoyed the action in this book! The plot was interesting and kept me reading. I did not know this was the second book in a series. I feel as if I had read the first book I would have known the characters better. Honestly, I couldn't finish this book. Idk I just wasn't into it, and it wasn't for me. I think it moved too slowly for me. I feel like it could definitly be very interesting for somebody though. I would say if your into mysteries and want a light read then go for it. Excited to read this book by fellow UCSC alum, Nora McFarland. I won this book from First Reads. Looks like a good book. Hope to read it soon. Thank you. Not bad for what it is, but what is it isn't what I'm after. This is a great book! I thoroughly enjoyed both the characters and the plot - I can't wait to read the first one now! Lilly is at it again and this time in the middle of a wildfire. Same great humor and fast pace as the first book in the series, A Bad Day's Work.